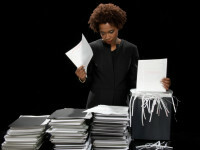 Looking at a pile of papers as you organize for the new year and wondering what to shred and what to recycle? The American Forest and Paper Association’s Paper Recycles campaign can help. They recommend only shredding documents with sensitive information. Shredding shortens paper fibers, but recycling whole pieces keeps the fibers long, strong, and ready to be made into new paper. Visit the “Paper Recycles” website to learn more about paper recycling. Then be sure to pledge to recycle more of all your waste materials.